Bailey-Rae, SWV, Jon B, Janet Kay, Carol Thompson, The Heptones, Ken Booth to name a few. He has fine tuned his topical gags by working as a stand-in on the highly popular BBC TV show ‘Mock The Week’ & his improv skills on BBC’s ‘Fast & Loose’. TV Appearances include BBCs’ Mali Monologues’, MTV BASEs ‘Kojos Comedy Fun House’ & FLAVA TVs ‘Real Deal Comedy Jam’. His many highlights have included, organising & hosting his 'Come Mek We Larf' comedy nights at Summerfest (1,500 people) held at the Pontins Prestatyn and Southport sites. To hosting The Hackney Empires New Talent Show at the Edinburgh Festival. His gig hit-list has also included performances at The Respect Festival - Millennium Dome and Cambridge University. He performed (Acting/Sketches) in the LIVE Stage Version of BBC’s ‘The Real McCoy Reconnected’ & toured with ‘The Real McCoy Comedy Explosion’. After 4 years of doing 1hr sets at The Theatre Royal Bar Stratford, he performed his 1st solo show ‘Snigger Please’ at The Drum, Birmingham in Sept 2010, to a sold out audience. International performances have included headlining in Da Bounce Rotterdam & Amsterdam, The Geel Reggae Festival in Belgium, Entertaining Troops and Civilians at NATO HQ in Belgium and various US Military bases in Germany. He has performed many times in Spain, all over New York & Los Angeles USA, and even exotic places such as Sri Lanka. 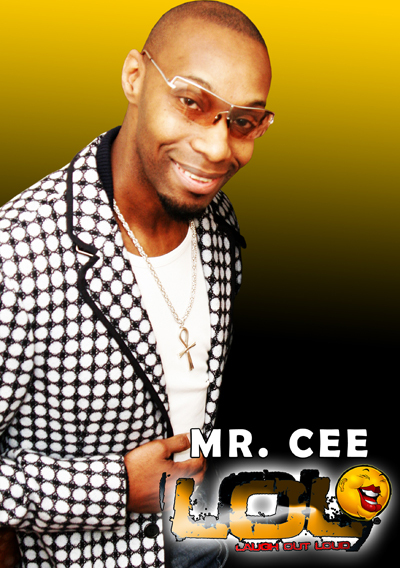 His Comedy reaches & resonates with all cultures Whether performing at small intimate venues or the big stage, Mr Cee is equally comfortable & in tune with his audience. His Social awareness skills has naturally provided joy to a plethora of organisations & associations, from local government, youth services to HMP’s. He is the perfect Gentleman for black-tie, weddings & bespoke corporate events. As a qualified trainer & assessor, his love for comedy has seen him mentor countless other comedians into the industry & he tutors Stand-Up Comedy Workshops, at The Comedy School near Regents Park.